Internet information service is an extensible web server service which is mainly developed and maintained by Microsoft Corporation. It is implemented as a set of several system services that use the most common Internet protocols including HTTP, FTP, NTTP and SMTP. 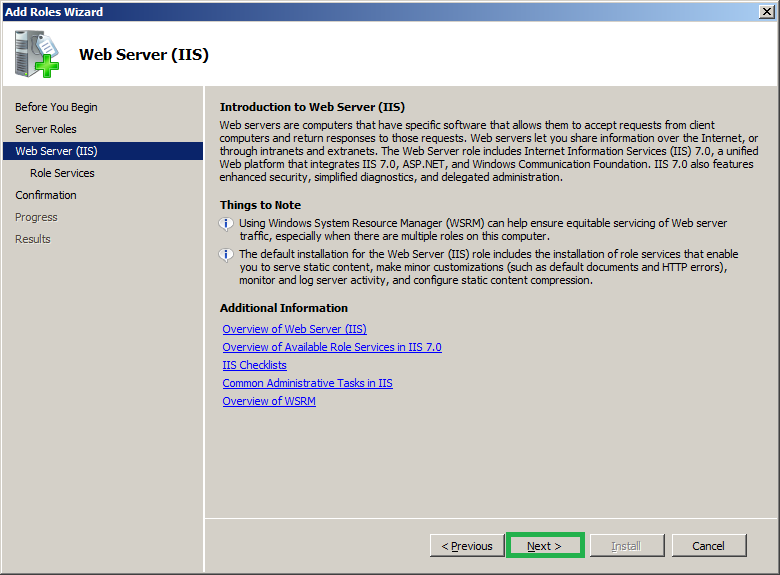 IIS features are managed using the IIS manager console. 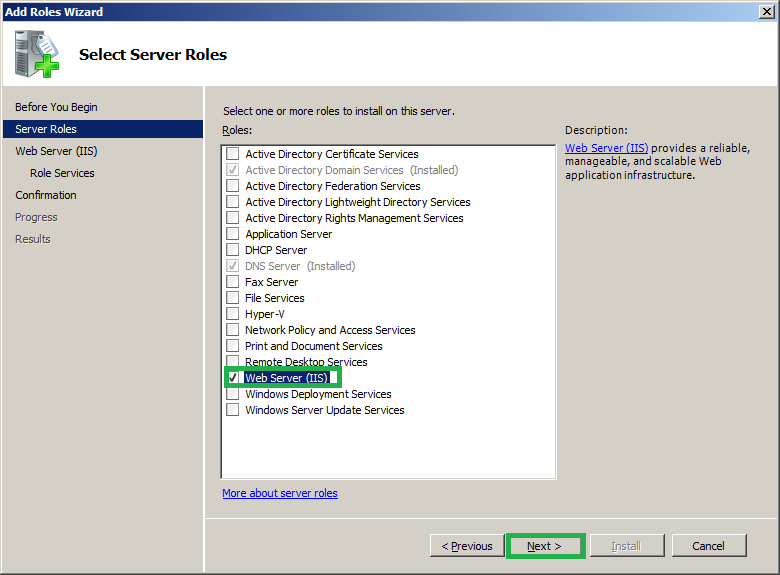 The service will not be installed by default in Windows server platforms. You can install this services as required from server manager. 1. 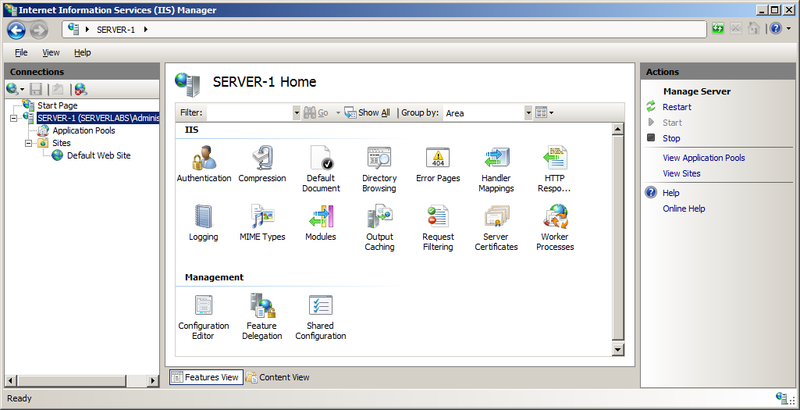 Navigate to Start->Administrative tools-> Server manager. 2. Now from the tree view, select Roles then in the Roles pane click Add Roles. 3. On the welcome window make sure that you have met all the pre-requisites and click on ‘Next’. 4. The next wizard will list out all the server roles that can be installed (Roles that are already installed will be greyed out). 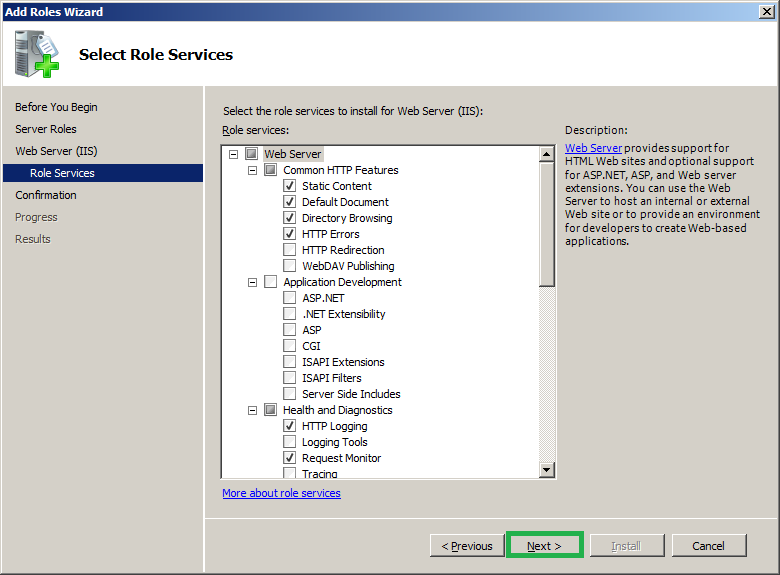 Since we need to install IIS select the roles ‘Web server (IIS)’ and click on ‘Next’. 5. 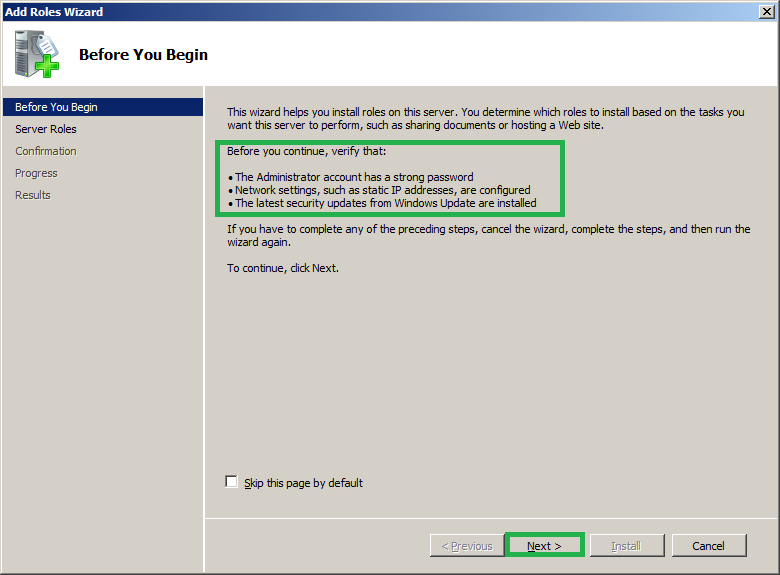 Now you will have an introduction to IIS service, read the information as you require and click on ‘Next’. 6. At this point you may see the windows to add features. Select the features that you required to configure and click on ‘Next’ (The default selection of features will includes only basic features that required hosting a website, however you can add any of these roles later at your convenience). 7. You can have summary windows which will list out all the configurations as specified on previous steps. 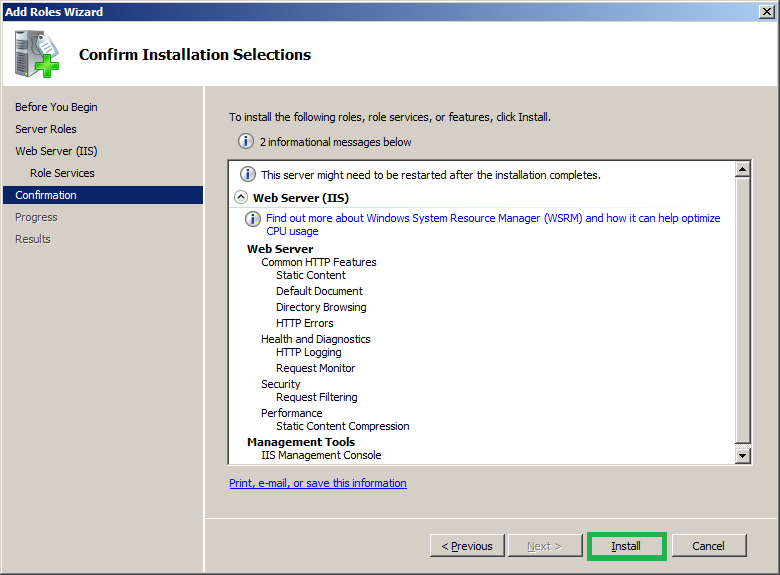 Verify the configurations and click on ‘Install’. 8. It will start installation of the specified roles wait until it completes. 9. 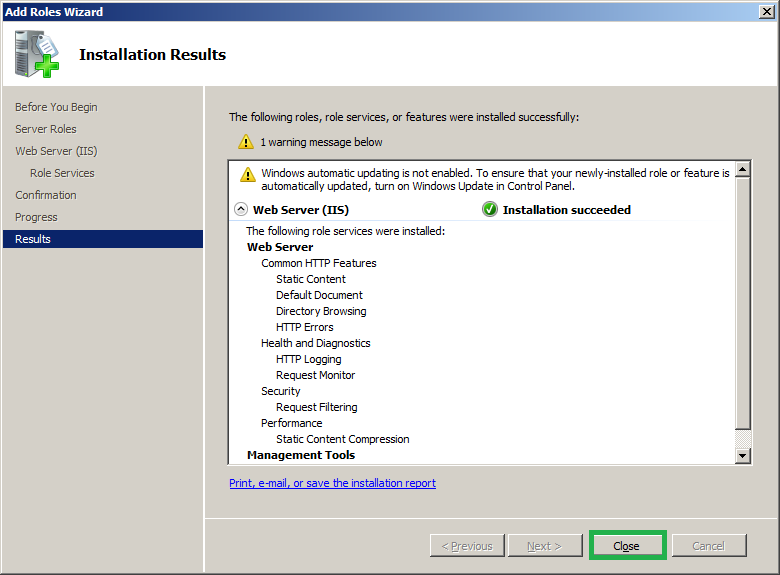 Once the installation is completed make sure that you have the success window displayed and click ‘Close’. 10. Now go to start->Administrative tools-> Internet information service(IIS) manager to open the IIS manager console and host your websites.